When you walk into the Prelinger Library, the first things you notice are the three long aisles that run down the length of the space. Ten banks of shelves, each 10 shelves high, flank each aisle, creating six rows of books. There are 30,000 or so volumes here, plus another 30,000 or so pieces of ephemera, from road maps to cell-phone instruction manuals. What you won’t find are card catalogs or librarians, although the library does have a pair of action figures based on Seattle author and former librarian Nancy Pearl (pushing a button at the back of the toy brings the character’s finger to her lips for “Amazing Shushing Action!”). The idea, as Megan puts it, is “to make a library into a workshop.” It is not supposed to be a passive, “silence please” sort of place. Need to take a call on your cell phone? No problem. Want to make a copy of something, or scan it, or photograph it? Help yourself. Since most of the library’s holdings are in the public domain, visitors can afford to create first and worry about copyright issues later. 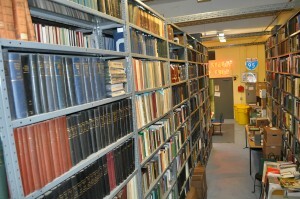 Rather than using the Dewey Decimal System or shelving books within a given subject area alphabetically, the Prelingers have organized their library using what Megan calls a “geo-spatial taxonomy.” Thus, in Row One, at the very top left, the library’s holdings begin with books on Alaska. From there, the books are organized geographically, so that states like Minnesota and Maine are at the top, with books on Texas and Florida near the floor. California and New York get more space because there are simply so many more books on those places to shelve. From geography, the collection eases into cartography, natural history, ecology, and the elements, which at the Prelinger Library is the trigger to move into a section on soil. That leads to agriculture, which leads to books and bound periodicals on extraction industries, which takes you to industries, mechanization, the built environment, transportation, city planning, suburbs, entertainment, and on and on. To tour the library is to walk through a landscape of ideas. It’s like a Harper’s Index for books, where one section and area of inquiry becomes a catalyst for the next; where the connections between disciplines and subject areas are as important as their content. It’s not an organization you will find in any other library in the world. It’s personal, intuitive, and informed. Equally useful is the Prelinger’s website, which includes an essay by Megan on how the library is organized, as well as links to 3,756 downloadable books, which can be accessed for free in a variety of formats, whether you want a pdf or something to put on your Kindle. The Prelinger site also offers free hi-res downloads of 2,146 films—from glimpses of the opening day of baseball season, April 2, 1918, in Oakland, California, to a trip to the Bell System Pavilion at the 1964 Seattle World’s Fair. Row Five ends with books on space, so that if you follow the logic of the library’s organization, you will have traveled from the Western United States with your feet firmly on the ground to outer space. A sixth row features deeper and taller shelves for oversize items such as city plans and children books. A comfy chair is strategically positioned near these, in case you want to curl up, read a bit, and doze off and dream. Of course, the library is always evolving. Current bound periodicals on the wish list include “Milk Plant Monthly,” “Journal of Recreational Mathematics,” Prison World,” and pre-1935 issues of “Sunset.” If you’ve got a basement or attic full of such treasures, Rick and Megan would love to hear from you. The Prelinger Library is at 301 8th Street (at the corner of Folsom) in San Francisco. Hours through August are Wednesdays from 1-8pm, plus Sunday the 29th from noon-5. 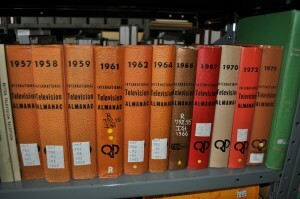 For more information, visit prelingerlibrary.org or email info@prelingerlibrary.org. For information on Megan’s recently published book, “Another Science Fiction: Advertising the Space Race 1957 – 1962,” visit anothersciencefiction.com.